With Halloween over, ghostly decorations are now being replaced by Christmas themed ornaments, many of which glow in the dark. This glow, termed luminescence, is produced by chemical and biochemical reactions or when electrons in a material are excited to higher energy states upon exposure to light. Luminescence of the latter kind is called photoluminescence and is widely used in fluorescence microscopy and in developing different types of sensors. 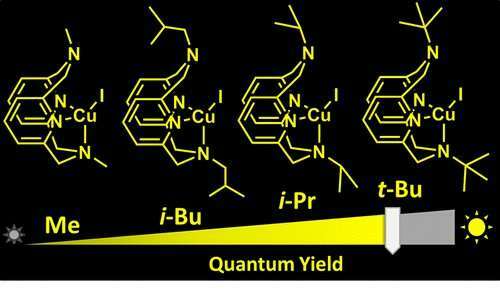 Now, researchers from the Coordination Chemistry and Catalysis Unit at Okinawa Institute of Science and Technology Graduate University (OIST) have discovered that by combining copper with organic molecules, they can create metal complexes that exhibit photoluminescence. What's more, by varying the sizes of those organic molecules, they can control the brightness of the emitted light. The study has been published in the journal Inorganic Chemistry. 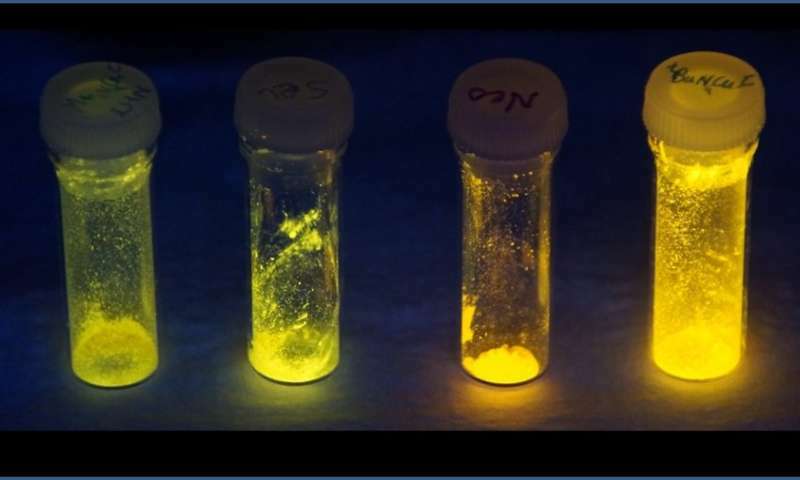 Researchers have traditionally created photoluminescent metal complexes using materials such as platinum, ruthenium, osmium, rhenium and iridium, for use in objects such as the dials of some watches and clocks. However, these precious metals are very expensive, and the compounds they form are toxic to handle. Copper complexes on the other hand, provide a cheaper alternative and have a structure that scientists can easily manipulate. In this study, the scientists created photoluminescent copper complexes by combining copper atoms with organic molecules, or ligands, with different amine groups. "The process of constructing the copper complex is a simple one and starts with the synthesis of suitable ligands," explains Dr. Pradnya Patil, a post-doctoral researcher and the study's lead author. She synthesized four similar ligands molecules—N-methyl, N-isobutyl, N-isopropyl and N-tert-butyl—that varied in size, with the N-methyl molecule being the smallest and the N-tert-butyl molecule the largest. The idea behind this study first struck Prof. Julia Khusnutdinova many years earlier. During her post-doctoral research, she discovered that the ligand molecules used in this present study, were very dynamic in nature as their ability to bond with metal atoms was accompanied by many variations in their molecular shapes and motion. The four ligand molecules were then combined with copper to produce metal complexes and their molecular structures were examined using advanced techniques such as X-ray diffraction and NMR spectroscopy, to determine their size. The smallest copper complex, which contained N-methyl, moved more flexibly and swiftly compared to the other three, whereas the copper complex with N-tert-butyl was the slowest as it had a bulkier molecular structure. To their surprise, the researchers found that the slower the molecule, the brighter the light it emitted. Taking this new finding further, the researchers incorporated molecules with structures similar to these copper complexes into polymers, so that they could be used in a wider variety of applications. This has allowed them to create molecular probes that glow brighter when subjected to mechanical stress or strain. "Such a material has the potential to create new methods to prevent failure of construction materials as it will help detecting wear and tear before the material actually breaks. This study sheds light on the mechanism of such stress detection," says Prof. Julia Khusnutdinova.